Each nook and cranny around the yard is home to a woodpile, the contents collected through years of beaver-like industry. Dead trees, old tables, builders off cuts – all meet their fate beneath the blades of chainsaw and axe. Once decimated they are laid out and stacked in funereal precision, awaiting their time of cremation, for in their final demise is the provision of light and warmth, of life, over the winter months. 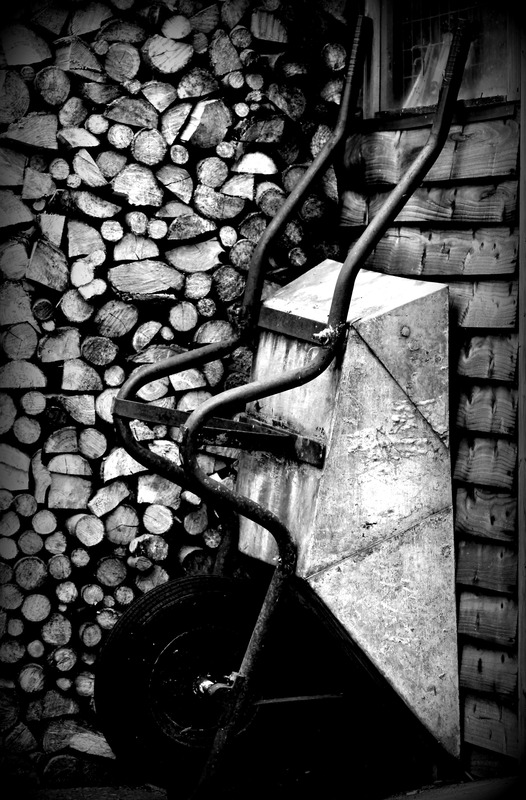 This is my entry for Cee’s Black and White Photo Challenge: Wood. To find out more about this challenge or to see more entries, go here. Thank you for having such a great challenge to enter! There’s something mysteriously romantic about a black and white photo. I really liked the written piece that accompanies it. Thanks. 🙂 I love black and white – though I’ve not actually used it a lot before! I’m glad you liked the written piece. It was going to be just the picture until a little while before I hit publish. It just didn’t feel complete! That leaning wheelbarrow leaves you wondering ‘what in the world?’ until you’ve finished scrolling down to get the full picture … kinda like doing a strip-tease. Good job.